Jean-Luc Dubois, J. Brazdil and Thomas F. Degnan Jr.
Metal Oxides in Heterogeneous Catalysis is an overview of the past, present and future of heterogeneous catalysis using metal oxides catalysts. The book presents the historical, theoretical, and practical aspects of metal oxide-based heterogeneous catalysis. The book also touches heavily on the biomass applications of metal oxide catalysts and environmentally related/depollution reactions such as COVs elimination, DeNOx, and DeSOx. 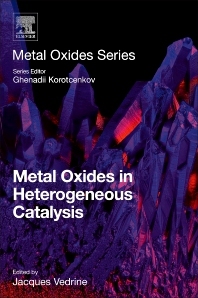 Finally, the book also deals with future trends and prospects in metal oxide-based heterogeneous catalysis. Jacques C. Védrine has worked in the field of catalysis since the 1970s. Among his many accomplishments, he was awarded the Grand Pierre SUE Prize in 2001 and elected president of the Catalysis Division of the French Society of Chemistry (Societe Chimique de France) 1994-1997. He has had many leadership roles including serving as an elected member of the French national committee of scientific research (1996-2001), as a member of the EUROCAT group in the 90s and elected as president of the “European Federation of Catalysis Society” (EFCATS, 1997-1999). He was editor for Europe, Africa and Middle East for Applied Catalysis A: General from Elsevier 1981-2014. He has authored more than 400 publications in international journals and 7 books; 250 conferences or communications, including 30 plenary lectures and 50 invited lectures. His scientific interests cover: Heterogeneous Catalysis (selective oxidation on mixed oxides and polyoxometallates and acid catalysis on zeolites, sulfated oxides, etc), combinatorial catalysis and physical techniques of catalyst characterization.